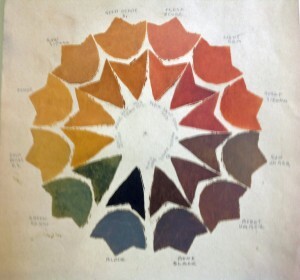 Artist Gustave Baumann created this autumn-toned color wheel in 1930. Not all of Santa’s presents end up underneath someone’s Christmas tree. Quite a few of them landed in our collections. Generous donors surprised and delighted us with some remarkable year-end gifts. We’re still sorting through the record-keeping details, but here’s a peek at a few donations that will help us better tell the story of New Mexico. Last fall, former U.S. Treasury Secretary Katherine Dávalos Ortega, a Tularosa native, visited the Fray Angélico Chávez History Library to ask about our interest in acquiring some of her memorabilia. “We were very excited to accept and receive her inauguration dress, her appointment document, awards and the original template of the $1 bill with her signature,” said Librarian Tomas Jaehn. The Ann Baumann Trust gifted the Palace Press with more than 100 wood blocks carved by artist Gustave Baumann, plus a series of color swatches and wheels crafted by the master printer. The Press is also working out final details to acquire a never-published manuscript by Mary Austin, The Little Saints of New Mexico, along with 76 Baumann blocks illustrating it. Leech hopes the Palace Press will be the first to print the book. More importantly, he said, the museum is building public knowledge of Baumann’s process.